Vickie's Kitchen and Garden: Donuts from a Can of Biscuits! Donuts from a Can of Biscuits! Since the girls were little I have been making donuts from a can of biscuits. It became one of our special Saturday morning treats that they got really excited about. Now many just a few years later the excitement for biscuit donuts is still around because we have a new generation coming to breakfast. The grand kids really enjoyed these the last time they came for a visit. Making donuts from a can of biscuits is easy and can be done in a flash. It's a frugal breakfast especially if you are like me and get the biscuits on sale for 89 cents! You can use either grand biscuits or the regular biscuits. It really doesn't matter. I was making these donuts before they had grand biscuits and they loved them. Just adjust your cooking time. You will need to put a hole in the biscuits (donuts). I have used many things like the top to a plastic bottle of soda (cleaned) but an apple corer is perfect! Don't forget to save the donuts holes and fry them too! Fry the donuts in a skillet with about 1 1/2 inch of vegetable oil on med heat in a iron skillet. Turning till they are brown and done. As the donuts are done put them on a paper plate lined with paper towel or napkins to drain. Then decide how you are going to frost them. The sky is the limit. This last time I used both cinnamon sugar and chocolate frosting. Some other suggestions are using creme filling (I'm still experimenting) or putting powdered sugar on top. Just have fun! They are delicious! 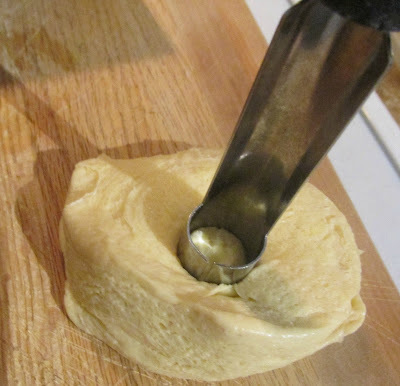 Have you made donuts from a can of biscuits before?